Bergman, Brian. "Titanic Tourism Boom (en anglais seulement)". The Canadian Encyclopedia, 10 September 2018, Historica Canada. https://www.thecanadianencyclopedia.ca/fr/article/titanic-tourism-boom-en-anglais-seulement. Accessed 25 April 2019. For good or ill, the City of Halifax seems inextricably linked to the tragic April 14, 1912, sinking of the RMS Titanic, which saw 1,522 souls succumb to icy Atlantic waters. As the nearest major port to the disaster, Halifax is where many of the dead were brought to be buried or claimed by relatives. The international media descended on the East Coast community to document the grim spectacle as the corpses of millionaires and paupers alike were lined up along the piers. Eighty-four years later, the city was again in the spotlight as film director James Cameron spent 17 days in the Halifax area shooting a small slice of what would become Titanic, the top-grossing movie of all time. On the last day of filming, the cast and crew tucked into a seafood chowder that had been spiked with enough PCP (angel dust) to send 80 of them to the hospital. While they all recovered, the incident garnered headlines around the globe. Surely, thought many Haligonians, their city's curious affiliation with the world's worst single-vessel shipping disaster could not get any stranger than that. Since the release of Cameron's astonishingly successful movie, Halifax has been basking in its reflected - some would say, surreal - glory. It began, innocently enough, with the widely respected Maritime Museum of the Atlantic brushing off its small permanent collection of Titanic artifacts to create the nucleus of a full-blown exhibit, Titanic: The Unsinkable Ship and Halifax, Nova Scotia. 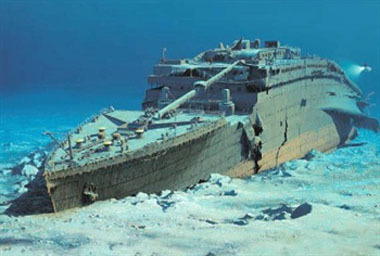 Timed to coincide with the film's release last December, the exhibit pointed to a little-known fact: that Halifax was the final resting place for 150 Titanic victims, the largest concentration in the world. Local fans of Titanic began scouting out the Fairview Cemetery, where 121 of the dead lay buried under three rows of plain granite markers. Some stumbled upon the tombstone of one J. Dawson - and wondered if he might be the model for Jack Dawson, the dashing leading man in the film, played by teen heartthrob Leonardo DiCaprio. Soon enough, cemetery caretakers spotted visitors - mostly teenage girls - leaving flowers, paper hearts and movie ticket stubs at the foot of J. Dawson's humble grave. Suddenly, Halifax was hot again. The U.S. tabloid TV show Hard Copy dispatched a camera crew to investigate the J. Dawson phenomenon. 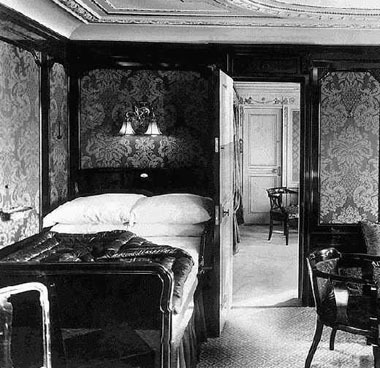 Several European television networks, People magazine and newspapers ranging from The Boston Globe to the Bangkok Post also featured items on the city's Titanic connections. Even the august Sunday Times of London sought out Halifax curators for some learned comment. Civic boosters, knowing a gravy train when they saw one, have decided to jump aboard. Local companies are staging special Titanic bus tours this summer, ferrying visitors from the dockyards where the bodies of Titanic victims first landed, to the graveyards where they are interred, to the harborside museum where they are commemorated. The municipal and provincial governments have agreed to spend $600,000, both to expand the museum exhibit and to restore the long-neglected Titanic gravesites. Halifax's ebullient mayor, Walter Fitzgerald, told his fellow councillors that the Titanic craze signalled a type of tourism the city had barely exploited. Perhaps, mused Fitzgerald, visitors might like to learn about other local disasters, such as the 1917 Halifax Explosion, which killed 2,000, or the 1873 sinking of the SS Atlantic near Terence Bay, just south of the city, which claimed another 562 lives. "You can almost make a tour and pay your respects," observed the mayor. "And you can also take in money." In that spirit, one Halifax restaurant, The Warehouse, has turned its private dining room into a culinary shrine to the Titanic. An entire wall is given over to a local artist's rendering of the grand staircase that figured so prominently in Cameron's film. 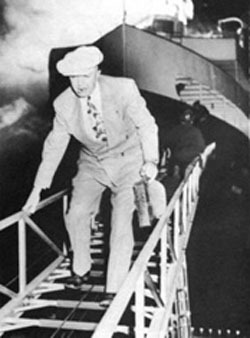 For $60 per person (before taxes or drinks), patrons partake of six of the 11 courses offered to the first-class passengers on the night the ship went down - including poached salmon and Waldorf pudding. As a violinist and cellist play period pieces, an actor assuming the character of Titanic Capt. E. J. Smith works the room, encouraging diners to take on the identity of some of the ship's better-known passengers, including John Astor and "The Unsinkable" Molly Brown. The restaurant's marketing director, Elizabeth Newman, says bookings are already brisk from corporations and tour groups. Newman admits that when they first conceived of the dinners, there was some concern that it might appear a tad ghoulish. "We thought, 'Why would you want to have what they ate the last night?' " she says with a laugh. "But that's what people want - don't ask me why." One reliable anchor amidst all the Titanic hoopla is the original Maritime Museum exhibit. It documents in gripping detail how Halifax, 1,300 km away from where the ship sunk, became a "city of funerals" in the days after the tragedy. While survivors were taken to New York City, many of the dead were loaded on three Halifax cable ships. When the first of the ships, the Mackay-Bennett, approached the Halifax dockyards on April 30, 1912, church bells tolled, flags hung at half-mast and hearses lined the piers. Adhering to the strict class barriers of the day, bodies of first-class passengers were unloaded in coffins; the rest were toted out in canvas bags or on open stretchers. Most of the bodies that were not sent home ended up at the Fairview Cemetery - including crewman James Dawson, a 23-year-old coal stoker from Southampton, England, who bears little resemblance to the fictitious Jack Dawson, the American artist played by DiCaprio, who spent most of Titanic wooing a winsome Kate Winslet. Gerry Lunn, curator of visitor services for the Maritime Museum of the Atlantic, acknowledges that all the media attention on the Dawson coincidence has been "a little wearying." But staff at the museum, which has attracted more than 60,000 people during the first 4½ months of 1998 - triple the number over the same time last year - are seizing the opportunity to distinguish between myth and reality. Says Lunn: "I've said all along, 'You've seen the movie, now come to the museum to get the real story.' "
There are, in fact, already some signs of a Titanic backlash. At least one tour group operator, Betty-Ann Brekka, owner of Cabana Charters, will not be sending clients to the gravesites of Titanic victims. Brekka, who has a mother, father and sister buried at the Fairview Cemetery, finds the notion offensive to both the dead and the living. "There are certain things you can take advantage of," she says bluntly, "but a cemetery is not one of them." That sentiment was echoed one recent foggy afternoon, as about 80 high-school students from across Canada milled among the Titanic tombstones. In Halifax for a conference on Canadian studies, the teenagers were on a pre-arranged tour. "It's just not right," said Stephanie Seaman of Lampman, Sask., summing up what appeared to be the majority view. "I find it very disrespectful." Such reactions might give civic boosters, salivating over this summer's bottom line, pause for concern. Except for one thing: many of the students, including some of the vocal critics, were busy snapping pictures of James Dawson's tombstone, or of each other strolling among the granite markers. Click! The show has just begun. Until the Titanic sank in 1912, the dubious honor of being "the world's worst single-vessel marine disaster" belonged to the SS Atlantic, a steam-ship that ran aground near Halifax on April 1, 1873, killing 562 of its 1,000 passengers. For 125 years, 277 victims of the SS Atlantic rested in relative obscurity in an oceanside graveyard in Terence Bay, a tiny fishing village about 32 km southwest of Halifax. This January, however, some Terence Bay residents made a grisly discovery: after years of soil erosion caused by waves crashing up against the grave sites, human bones were spotted sticking out from the bank. A local Anglican minister, Rev. Glenn Eason, is in the process of lobbying the provincial and municipal governments to kick in up to $50,000 to refurbish the graves and protect them from further damage. Eason says his campaign was aided by the hoopla surrounding Halifax's connections to the Titanic. "Governments aren't known for throwing their money around for nothing," he says. "I don't think this would have happened a couple of years ago." Owned by the White Star Line, which would later construct the Titanic, the 3,300-tonne SS Atlantic was en route from Liverpool to New York City - carrying mostly European immigrants seeking a new life in North America. Its captain noticed it was low on coal and decided to head to Halifax to pick up additional supplies. High winds and waves, along with navigational errors, conspired to knock the ship off course. At 3 a.m., the Atlantic hit the rocky tip of Mosher Island, near Terence Bay, at full speed, tearing a huge gash in its side. Survivors clung to the rigging until dawn, when local fishermen launched the first of several rescue missions, helping to save more than 400 lives. Victims were later buried in two large trenches dug into a grassy knoll overlooking the ocean. While the Titanic's notoriety relegated the earlier shipwreck to the back pages of the history books, the story was kept alive in the area's fishing villages, where residents took quiet pride in the role their forebears played in responding to the tragedy. Now, some are concerned that the recent wave of publicity could disrupt their way of life - especially if anything comes of recent talk of making Terence Bay, nearby Peggy's Cove and Halifax's Titanic sites, part of a package tour. "The thought of busloads and busloads of people scares us a bit," says Eason. "It would be new and quite devastating." It is one thing to aid the dying and deceased - and quite another to accommodate the idly curious.